Now, I know some of you don’t decorate right away and that is OK’. I know some that decorate the day after Halloween, right before Thanksgiving, after it, on December 1st, or later. Whenever you decide to decorate, that is your choice. One thing that can become over whelming is a messy, un-organized, over cluttered etc. home… especially when you think of dragging in all those holiday bins. If you follow me on Instagram, then you would have seen that these last couple of days I was on a deep cleaning/purge in our downstairs. I was sharing a ton of insta stories (that have since deleted as they do after 24 hrs.) anyway, I was motivating and inspiring some you, because you were DM’ing me and telling me so. It feels so much better to clean, toss out, and organize spaces “especially” before the busy holidays. I mean who wants to bring in a bunch of Holiday decor when you have a coat closet that may be bursting at the seams. GASP! Anyway, I think you all catch my drift. 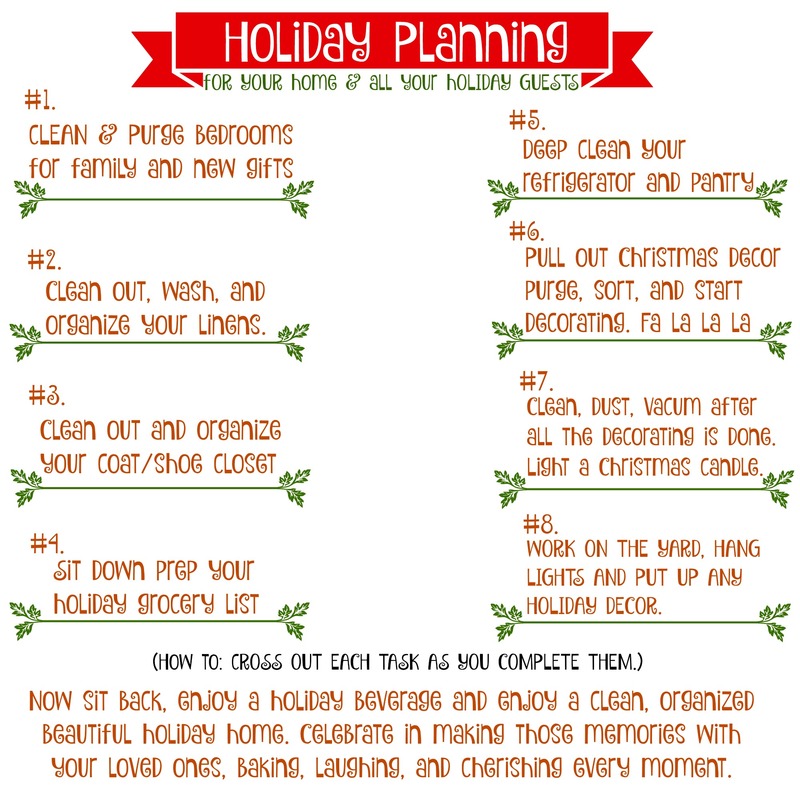 This printable is a great organized tool to help you prepare your “home and guests” for the holidays. Start with #1 and go through each number until they are done. I say spend a weekend or a couple days of your choice and crank that favorite music and get working. Enjoy this free printable from yours truly.